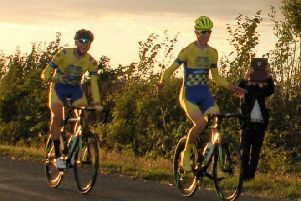 Staveley’s very own ‘Batman and Robin’ produced yet another top-level display of race-craft to further dominate with a table topping performance of Road Racing at Dinnington during the week. The Andy Moore Autocentres / J. E. James Racing Team were once more looking to extend their comfortable position as league leaders in the NMRRL Series. And, with rider Dean Watson having claimed victory in the last two rounds, team manager Andy Moore directed his squad to maintain the attacking run and aim for the podium yet again. With a line-up comprising Watson, sprinter Aaron Chambers-Smith, Jono Dexter, Steve Paterson and the recovering Andy Bishop, the team immediately went on the offensive from the flag. An early drive from Bishop showed no lack of commitment or confidence, despite his recent race crash, and a fearless 50mph attacking descent from the Worksop rider soon opened up the peloton. Unsure as to how to deal with the threat, it took a while for the bunch to respond, and it was only on the circuit’s climb where the group clawed back the advantage. With several other riders keen to build on the advantage, it looked as if a break may develop, but ultimately each attempt was nullified. The ever-watchful Watson needed to be patient and, with a couple of laps to go, the bunch was back together. Watson waited for the regrouping to occur and attacked with force, timing the final sprint with aplomb and crossing the line with a comfortable margin. Team-mate Chambers-Smith matched the attack well and claimed the second-place podium spot for the team. Team manager Andy Moore praised the squad for another winning display. He said: “Deano and Smiffy were the perfect Batman and Robin tonight. “We needed to focus 100 per cent on keeping up the pressure at the top of the table. The lads did a first class job of delivering the result and even though we’re in control – there can be no slip-ups. With three wins on the bounce for Watson, his lead at the head of the table has been further extended, and it looks as if the opposing teams will have a task on their hands to close down the advantage. 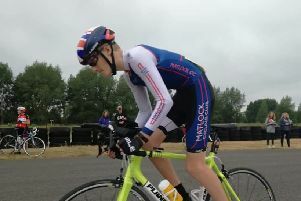 Elsewhere during the week, Dexter took the opportunity to get a few more race miles under his belt and claimed a fine fourth place spot in the Elite Race at Gainsborough’s Blyton Circuit. Dexter put in a solid performance to sprint to another points winning position and brought yet more success for the squad.